So I’m still continuing with updating issue #12 and working on some pages when I look back at what I’ve done and realise that there’s something that I messed up with in the original book that I AGAIN managed to mess up when I updated it! 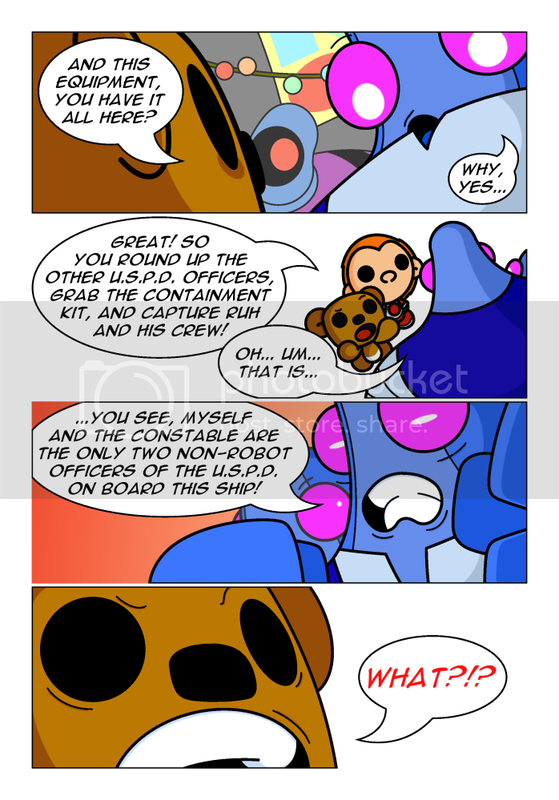 See, in the original comic you never see any non-robotic U.S.P.D. officers bar for the two main guys. Now, that was kinda okay in the original story but absolutely needed to be explained (for reasons) in the updated version! That is until I picked up on it yesterday morning and now updated the updated page! I dunno, it kinda just slipped past me but I felt the need to post about it after fixing the issue. Originally this page was a piece about Lloyd and Bear being a team as I wanted to show how the two guys have changed during this first overall arc. But hey! We know this already! I’ve banged on about it enough! So yeah, happy with the new page!